You should be checking your tire’s pressure at lease once a month and always before a long trip, we know that sounds like a lot but do it as often as you can. You can pick up/order online a pressure gauge for $15 or less. Tire pressure should be checked when the tires are cold, even driving a mile will cause your tire’s pressure to increase giving you an inaccurate reading. Don’t rely on your tire light! Your tire pressure monitoring system (! ), or TPMS, isn’t designed for tire maintenance. These systems are typically designed to alert you of a low pressure with a light in the dash when one or more of your tires are 20% or more below pressure, that means that you could have under inflated tires and the light isn’t on. If you are wondering: What is my correct tire pressure? – Then see our tire facts page to find out how to find out your correct pressure. Do I Need New Tires? – How Do I Check My Tires? 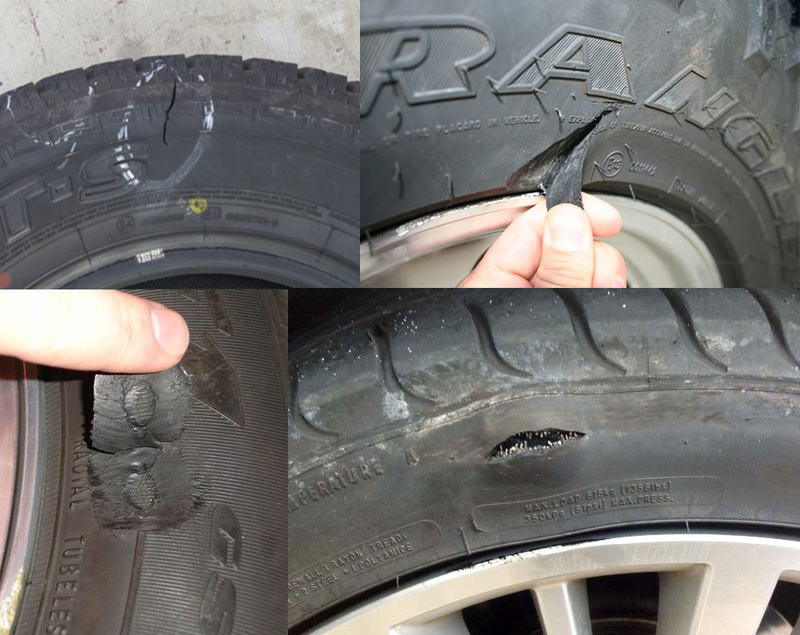 There are two popular ways to check for signs of tire tread wear. One easy way is the penny test. 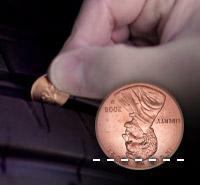 Simply insert a penny into your tire’s tread groove with Lincoln’s head upside down and facing you. If you can see all of Lincoln’s head, it’s time to replace your tires. Another way is to look at the tread wear indicator bar that’s molded into your tires. The bars are located at the bottoms of the tread grooves in several locations around the tire. When a tire is so worn that these bars become visibly flush with the adjacent tread ribs, it’s time to replace the tire. We’re sure you’re a fabulous driver, but how’s your parking? Curb damage typically from parallel parking doesn’t just affect the wheels, that rub that didn’t seem like much could be dangerous. Take a quick peek and check the side of your tires for cuts or gashes, these can lead to tire failure and should be replaced.